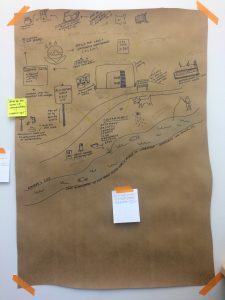 One of the only many overwhelming things about doing research is, how do you start to make sense of it? I’ve been compiling information for the past couple of weeks on understanding environmental remediation. I’ve been taking a page from George Marcus’ work on multi-sited ethnography in following a thing and that thing is Superfunds. There’s the specific location of the site itself, as a geographic location, but as I’ve started to dig in, it starts to spread out in different forms – such as the federal website that holds all the documents (cyberinfrastructures), the different equipment, tools and protocols used to determine presence of contaminants, and questions of future land use (the land adjacent to one of the sites I visited is actually for sale..). One question that I’ve been asking myself, is “how do we know if remediation is happening?” – is it evident through the sign on the site that says “RECLAIMED LAND KEEP OFF”?, or the site that is keeping progress, or the readings on the instruments used? While asking these questions is good, sometimes it is also helpful to start laying things out to understand the “space”. So this past week I started mapping out different connections in thinking about Superfunds. 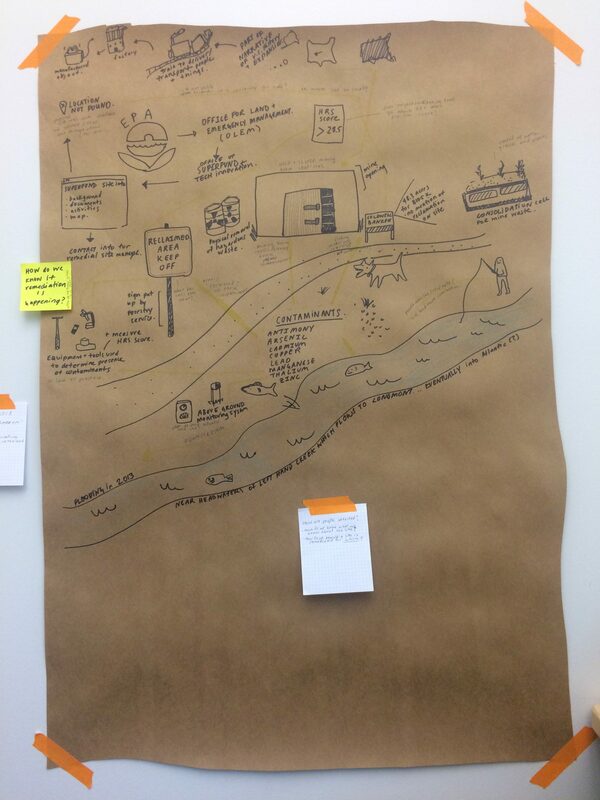 Here is my map in progress, approximately 2 feet by 3 feet, taped up onto the wall in my office. 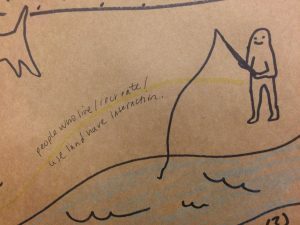 Things are drawn in Sharpie and colored in with marker, with connections made in highlighter (not the most visible on kraft paper). As someone who is more visually inclined, it is helpful to understand the elements of this space. 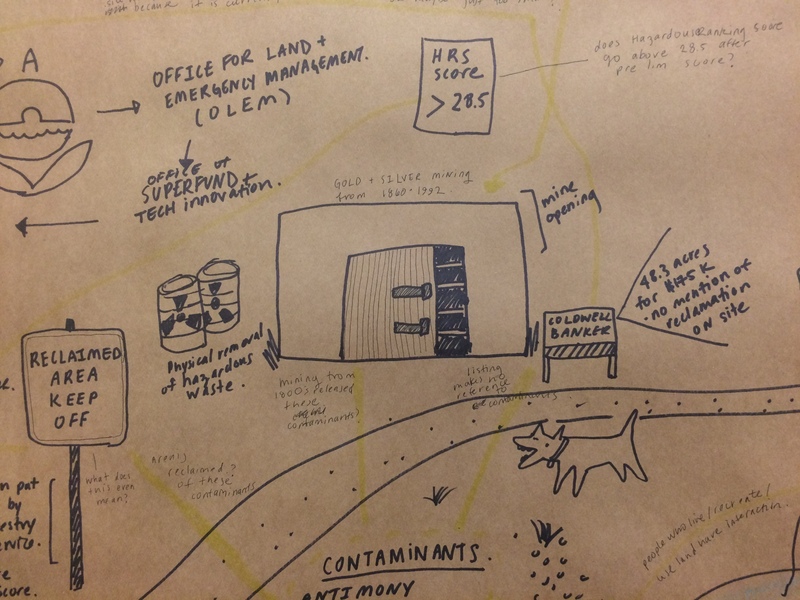 I actually went into this mapping process with Donna Haraway’s article “Awash in Urine” in mind. In this article, she lays out this entangled history and narrative around estrogen hormonal therapy that spans and transverses across different timelines, locations and species. 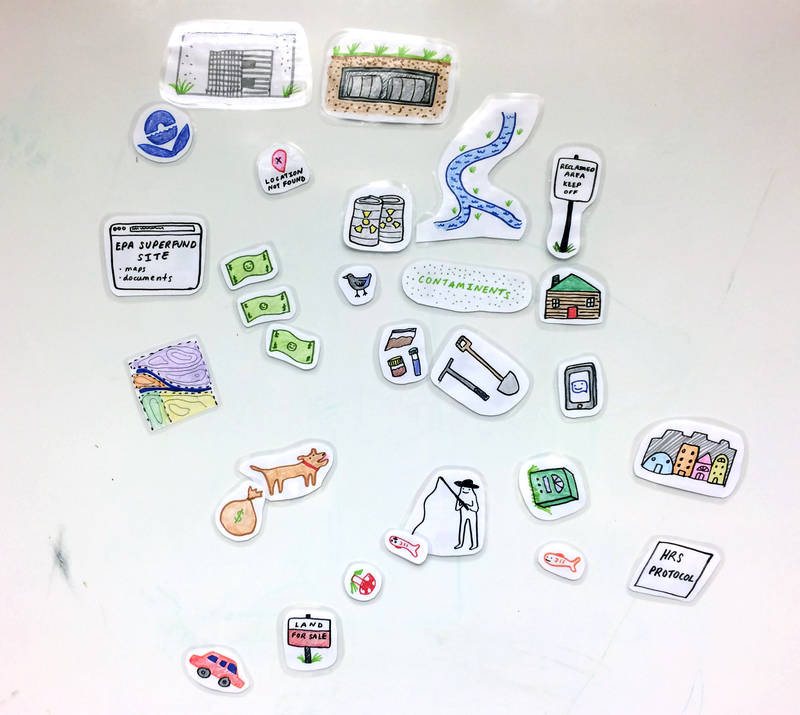 This is also tied into coming across Elaine Gan’s work in understanding entanglements through visual mapping. Although Gan’s style is far more elegant than mine, it does serve as a jumping off point in thinking about how to approach a subject that is super entangled. Detail shot! On some of these sites, you can actually see the opening to the old mine. 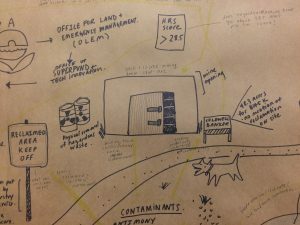 Also included, a sign that is on the site, barrels of removed waste, a “for sale” sign, HRS (Hazard Rankings Score) that is above 28.5 which indicates a site needs to be remediation, and a dog! 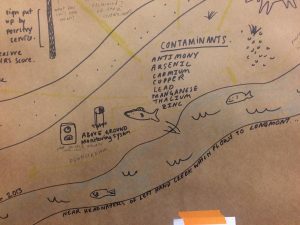 River and list of contaminants found at a particular site. 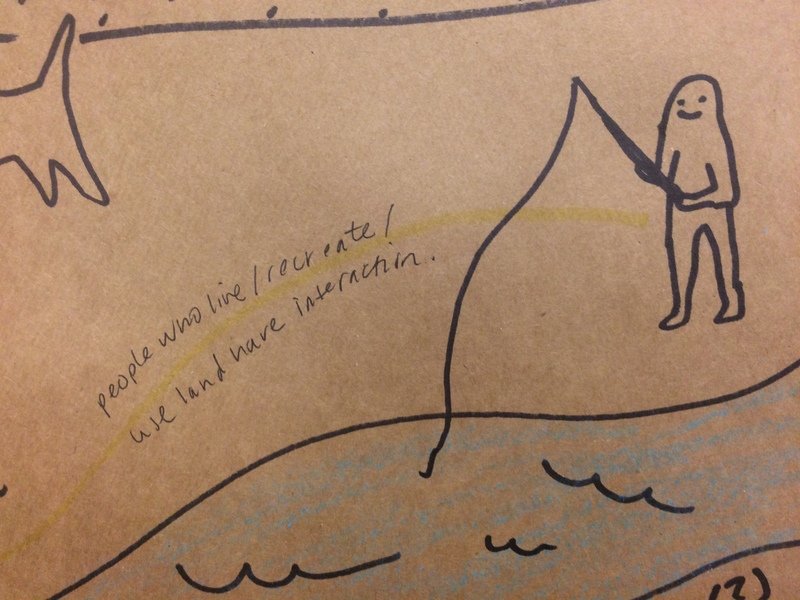 Also included is fish! (dead and alive), and above ground monitoring systems. 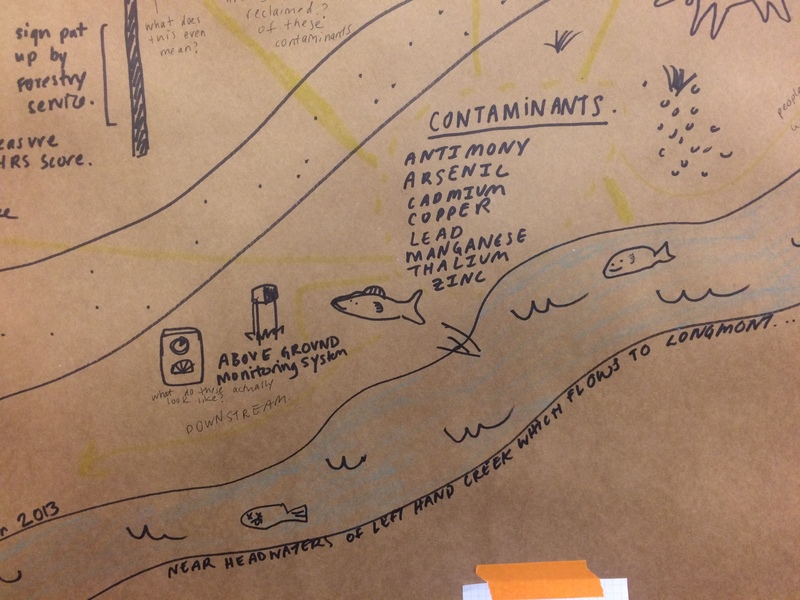 How do we trust this interpretation of sensor technologies in order to understand remediation? Can we have situated data that brings context to data when we are examining it? Sometimes drawing on paper can be frustrating because it is so stationary, especially if you choose to use sharpie! 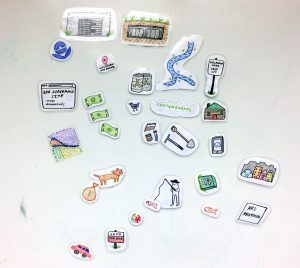 So this past Friday, I made laminated drawings and made them into magnets! Now these “actors” can be manipulated and moved on a magnetic whiteboard around as I try to build some form of understanding!